In our competitive world, many parents are keen to get their little ones learning as soon as possible in preparation for school. What many don’t realise though, is that children learn best through play. Not only is play very important for children’s happiness, wellbeing and development, play is the natural way children learn. In fact, play IS children’s work! It’s the way they learn to understand how the world and the people around them function. It sparks imagination, creativity, problem solving, negotiating relationships and a huge variety of intellectual and other skills – in fact everything they need to know about life and how to live in the world is learned through play! Play is also a child’s right and we as parents and adults have a very important responsibility to make sure that children have time, opportunity and materials to play. Does that mean we have to provide expensive toys? NO! With a little imagination, almost anything can become a toy for a young child – just make sure it’s safe, not long and sharp, not poisonous and can’t be swallowed. Some of the most effective toys are everyday household objects! Take the cardboard box. Smaller boxes can be stacked to make towers; put one inside the other; filled with pebbles or used to create something. Believe it or not – all these activities are the beginnings of science and maths – balance, symmetry, gravity, volume, capacity, weight, size, comparison, making predictions and learning through trial and error! If you take a bigger box such as an apple box – it can become a car, a stove, a table, a cupboard or a doll’s cot. Put 4 or 5 apple boxes in a row and you have a bus or train; arrange them in a square and you have a house; stack them one on top of the other and you have a tower. A toddler just learning to walk can push a box along or, if you attach a piece of string, pull it behind him – learning about push and pull – the beginnings of physics! Add a few props like old clothes for dressing up, some plastic cups for tea, rag dolls or a teddy, a small piece of wood for a cell phone and wonderful imaginative play will take place where children explore the adult world through their own understanding. They will love it if you join in and enter their make believe world. The kitchen is a great source of play for a toddler. Just make sure that cleaning materials are stored out of sight and reach; that pot handles are turned away and nothing hot can spill; that knives and sharp objects are out of reach and your kitchen is safe. Then your little one will find there are cupboards to open and close; plastic utensils to pull out, investigate, stack or put things into; pots and pans make wonderful drums; potatoes, squash, onions and butternut can be sorted, counted or put into patterns. Squash and oranges make wonderful balls to roll and chase. Your 3 to 5 year old child will love to feel they’re helping mum by counting out 1 potato each for supper, laying the table, mixing something, sweeping or helping with washing up. Mum, just grit your teeth and put up with the mess in the interests of all the learning taking place in your little one’s brain! 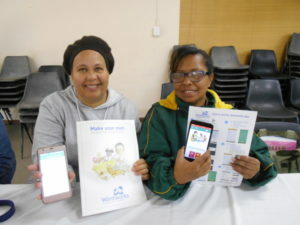 38 Worcester early childhood educators came to upload the Wordworks early learning App onto their cell phones. This exciting App can be loaded onto any android cellphone. It has masses of activities, songs, rhymes and stories for all young children from birth to age 5. Once downloaded it’s FREE! So download in a free Wifi zone. Open the Play Store App, search for Wordworks, click on install and follow the prompts. Once you’ve signed up and entered your details, you can select the age of each child to get age appropriate materials and the language you wish to use. You will get messages, information and activities daily during the week. For more information go to www.wordworks.org.za ; email: wordworks@thereachtrust.org or phone 021-8887000.